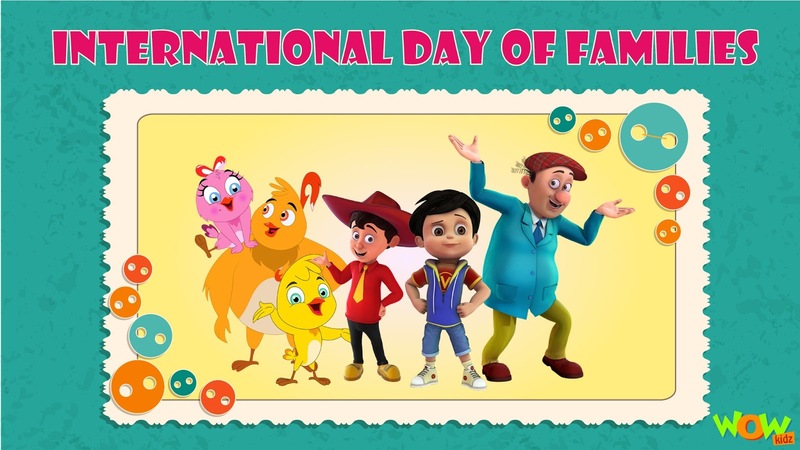 Wow Kidz: International Day of Families! A family by definition goes like “a group of people who are related to each other”, but it is more than that. It is a meaningful connection: an experience in itself. It is an incredible and an unbreakable bond—created by mothers, fathers, sisters, brothers and others. The feeling of being part of a family gives you the comfort in a world of uncertainty. As it happens to be the only relationship in one’s life that one doesn’t get to choose at birth, it is considered as “God's gift”. That being said, it becomes the most important heartfelt and pure relationship that one must hold on to. I remember my cousin who once did a project on designing his family tree. The concept of making a family tree is quite old, but people still do it to keep the posterity updated about who their ancestors were (lineage) and it also helps them trace their genetically inherent qualities. Family trees are often presented with the oldest generations at the top and the newer generations at the bottom. So, my cousin was able to trace and jot down his previous four generations but couldn’t go beyond that because of lack of available data. Extending this concept of a family tree, in reality, we all are like the branches of a big tree whose roots are much deeper than we think they would be. I recall a phrase from the Upanishads which means “The World is one family”( Vasudhaiva Kutumbakam). One may wonder how their small family can possibly have an impact on the entire world, but one fails to realize that this tiny representation is what the world is made of. Everyone is blessed with their own unique families and peace in this world does begin with peace at home. The home is where certain eternal qualities and values can be inculcated with culture and education. Every family has its own set of values, norms and beliefs which it passes on to or shares with the immediate smaller families and this in a way represents a network of families which we call a social circle or “society”. A family network might not necessarily be the ones with blood relations. The bond can also be of friendship, love and care. It is the people who matter who care for you and accept you. The ones who do anything to see you smile & love you no matter what, in a way become part of your family. The world consists of various such dynamic families and in-turn with this network the whole world becomes one big family. We are all a part of different families but we go through the same emotions with them. That’s what makes us one. Today, at the time, where there is always a fear existing among people be with respect to the tensions across territories or the possible inter-community feuds, the world needs love in huge quantity. Only then can we end the existing animosity among our fellow beings. As a start, in our homes, we could celebrate with the people in our immediate environment – a.k.a. our family on this International Family Day. Let’s become a true representation of happiness and set a fine example for this world. So this International family day, I have listed down few pointers, which each one of us should try doing. 5) If not possible to meet them physically, call them or drop a text. Don’t think too much if you haven’t spoken to them of late. It’s never too late to begin.